This FREE versatile writing activity can be used with ANY children's picture book and children love this lesson! The teacher will need to choose a favorite unseen book and 6 artifacts from the book that they will show the students one at a time. Artifacts can range from stuffed animals to represent an animal in the book, a bag of sand showing the book may take place at the beach, a fancy pencil if someone is writing a story in the book. etc. Be creative! Students will draw each artifact/clue and then add some vocabulary words, action words, temporal words or emotions they may be thinking about as they draw. Once the clues have been shown and sketches are done, students write about a quick memory or connection that they make have to any of the clues. This is now the pre-writing stage completed for their story. They will use this organizer to write the story they think is representative of the clues. Students share their varied stories aloud. The teacher then reads the book. Lots of discussion usually follows this. 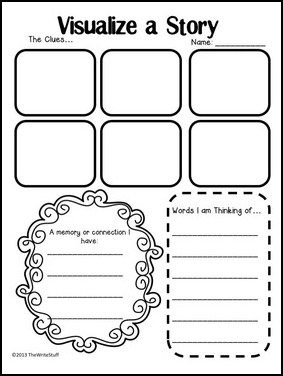 This is also a GREAT activity to do as a school wide write. It does not have to be based on a real book in that case but every teacher in the school is given the same clues. It is fascinating to see and compare the writing and imagination of a first grader and the writing and imagination of an older student based on the same clues! Here is a blogpost to show you how I teach this lesson. I hope you enjoy this activity! Free CVC Pages - No Prep! Teach Your Students Gerunds With This Trick!